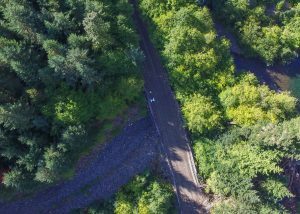 There are many drone users out there that have some experience with photo and video capture, but haven’t conducted many mapping missions with their UAVs. If you are just starting to explore how you can create quality maps with your drone’s data, or you are looking for extra tips, then this post is for you. Below is a list of tips that can help anyone that is new to UAV mapping avoid re-flying any missions, and to come out with the best results possible. If you are serious about data capture with your drone, you should be serious about following the rules, and avoid being the next drone pilot on the evening news for all the wrong reasons. In addition to appropriate ground school training and plenty of piloting practice, make sure that you have an SFOC in hand (Canadian advice), including proof of insurance… or confirm that you are operating under the exemption rules. Clicking on the graphic below will take you to an interactive flight planning tool that can help Canadian drone operators fly safer. 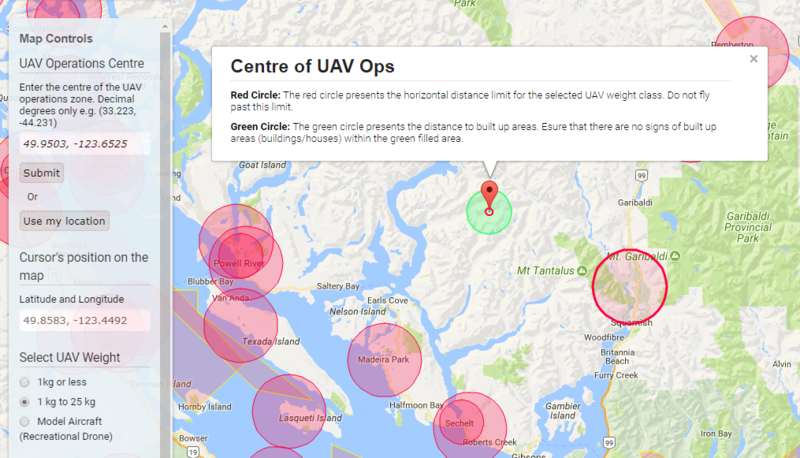 The UAV Site Selection Tool developed by Natural Resource Council Canada to help you fly safer. It’s also important to make the proper notifications through Nav Canada in the planning phase, at least 24 hours prior to your scheduled flight. This allows them to determine if a Notice to Airmen (NOTAM) should be filed if you are in within airspace where it is required. For that step, I use this Word template, which includes all the pertinent info but doesn’t take long to fill out and submit. Once filled out, you can send it to UAV_VR@navcanada.ca. Nav Canada has taken over the UAV notification process from Transport Canada staff, who used to be in charge of that. One thing I can recommend during this process is that you get in the habit of using Google Earth Pro (which is free to download) to get the coordinates of where you are going to fly, and scout any potential hazards while you’re still in the office. It also helps to avoid flying over built-up areas, putting people and property at risk, particularly if they are not the subject of the filming or mapping mission. When on site, make sure you have an aeronautical radio and are tuned to the relevant frequency. In addition to your UAV ground school, it’s important to also have your ROC-A certification (Study guide here), if that was not already part of your ground school curriculum. As an alternative to referencing local charts, you can check relevant frequencies using the ForeFlight app, a popular one among the aviation crowd. The UAV Platform. If you are mapping large areas with UAVs, the most efficient drone for the job is a fixed wing airframe. They have less drag and are more efficient in flight, which means less power consumption, faster and longer flight times, and more coverage over a shorter period of time. With that being said, you’ll notice that multirotor drones (e.g. DJI Inspire, Matrice series) are the most common drone platform today. A big part of this is due to the maneuverability, ease of use, and multi-purpose nature of these units. Fixed wing drones are great at mapping, but multirotors can also do inspection and filming very well, so they aren’t as much of a one-trick pony. With all that being said, multirotors can still be used for mapping small to medium-sized sites. In summary, both types of drones will work for mapping, but if you are consistently mapping large sites (greater than 100 ha / ~250 acres) I would recommend exploring a fixed wing option. The Camera. As I’ve discussed in other posts, equipment decisions should always start with the camera, which is the core of any commercial drone operation. Take some time to research the camera that you are mounting on the drone (or that comes stock with it). When researching the Matrice 210 initially, I was pleased to hear that the X4S camera has a leaf shutter, low lens distortion and a good sized sensor. This avoids the rolling shutter effect that can happen with many other electronic shutter cameras when mapping. We wanted a good all-around unit with the Matrice, and it has been solid for mapping missions, even if it’s not as efficient as a fixed wing for the same task. Ground Control Targets and a GPS Unit (ground based). These are two things that you don’t need with film or inspection drone work, but are very useful when mapping. If you’re unfamiliar with ground control and how it’s used, I’ve covered this in detail in a previous post. Having the ability to establish ground control is the basis for delivering quality UAV data, and is a core principle of photogrammetry. Ground control targets can be physical targets made of a durable but portable material, or can be painted on site (if that option is available). One of many ground control targets (iron cross design) spiked down and recorded with our survey-grade GPS prior to a UAV mapping flight. The more important piece of equipment here is the GPS unit. The one I’m referring to here is for recording positions on the ground, this is not the GNSS chip on the drone itself. This unit can take a variety of forms, but it’s important that you’re using an industrial-grade unit and not a cell phone or recreational GPS, for example. The accuracy of this device will dictate the quality of your ground control points and will affect your data processing down the line. As any mapping or survey professional knows, this follows the Garbage In, Garbage Out (GIGO) principle. Since you are providing professional data for the end user, you want to make sure that you are maintaining the level of accuracy that is appropriate for the job. Field Laptop. Whenever I’m out running a drone mapping mission, I always remember to bring a laptop loaded with my imagery processing software (in my case, we use Pix4D). First, this allows me to offload data from the drone to the laptop after every flight, which I highly recommend. This will keep you organized and also allow for review of the data to make sure all photos properly triggered and that you’re not missing any data, so that the mistake can be corrected right away. I often run a quick stitch of the data (in Pix4D there is a ‘rapid’ mode option) that also allows you to avoid any surprises back in the office. Sometimes it takes hours to travel to a site, and the last thing you want to do is have to cross your fingers that nothing went wrong when you’re starting to process the data. Instead, do this on site for piece of mind and to avoid any data blunders that would require re-flight. If you must re-fly a mission (which can happen), it’s obviously much better to find out while you’re still on site! For decades now, there have been traditional methods to capture imagery that did not involve drones. A common method is photo capture with full scale manned aircraft, where large cameras are mounted in the belly of the plane and used to capture imagery during flight. While the medium of data capture may be different, this follows core principles of photogrammetry that are also common to the UAV methods that many operators are using today. An example of this is the percentage of forward lap and side lap during flight missions. When planning flights, these metrics often mean the difference between seamless data and a broken, unstitched mess. I normally try to achieve 80% side lap and 80% front lap when I’m flying UAV mapping missions. This is often over steep terrain and dense forest canopy here in BC, the latter of which is one of the hardest landscapes to resolve in aerial photography, especially with wind shifting tree branches around during photo capture. Sufficient overlap, coupled with flying at maximum altitude here in Canada (~120 metres) can help to alleviate a lot of issues that can come from a shortage in photo coverage, or to recover from some blurry/poor photos (from windy conditions, for example). The percentage of side lap is much more significant as it relates to the duration of the mapping mission, as small increases in side lap can lead to many more minutes extended in the air. With front lap, this does not affect flight duration, you are only changing the frequency of photo capture so the number of photos will increase but the duration of flight will not change with all else being equal. Two critical settings in any UAV mapping mission. Altering side lap has a much greater affect on flight time, as a higher % leads to additional flight lines (Photo credit: NRCan, 2016). Following photo capture, there are a number of secondary data products that can be derived in addition to the orthophoto mosaic. One of these main products is survey contours, derived from the point cloud creating during processing. Once again, it’s important to respect the discipline that is involved here, in this case – the world of surveying. You may be able to collect topographic data but it doesn’t mean that you’re a surveyor. In order to deliver any professional survey product, it’s best to involve subject matter experts that can confirm the level of accuracy and precision that you are providing to the client, and to not interpolate your data to the point that it’s misleading. At a minimum, work with a surveyor early on in your business endeavors to best understand the data product that you are delivering. A step up from that would be to include an experienced surveyor in this workflow, especially when to comes to contour generation, survey data correction and QA/QC. One of the advantages to the current “drone boom” is that there are a lot of options when it comes to capturing and processing the images that you’ve collected. While you may hear about some solutions more than others, it’s important to take a step back and look at all of the options at your disposal. There are a few flight planning apps out there that are free or very low cost, because they monetize the app by getting you to also process your collected data through the same application. Personally, for DJI drone missions I use Map Pilot for capture, and Pix4D Mapper for stitching. They are both reliable and with Pix4D I have full control over each step of the process, which avoids a “black box” processing situation where I do not know what’s going on in the background. Although Pix4D is industry-leading software, it’s not the cheapest of options though, which can be tough to justify depending on the type of drone work you are doing and how much you fly. I’ve included a brief description of some software that can be used for mapping and processing below. Map Pilot for DJI (Drones Made Easy) – for data capture and processing. When flying our DJI units, this is my go-to flight planning app and I’ve had great mapping results. The developers included terrain awareness which is vital here in our mountainous terrain, and they have kept up to date with new DJI releases to keep things compatible. It knows how much battery is needed to return home so there is reduced risk of leaving it out there too long. CAD $13.99 for the app, then a pay-as-you-go pricing system for processing starting at $0.07 per acre. Pix4D Mapper – an industry leading processing software package, bringing professional photogrammetry to the masses. I have a lot of experience with Pix4D and appreciate all of its advanced features. It also has a strong following, heavy web presence and very detailed how-to guides available online. USD $300/month, or can get a bit cheaper if you buy annual or perpetual license. It still leads the way in its 3D interface when working with point clouds, ground control and imagery in my opinion, but you definitely pay to play. Pix4D also has a flight planning app called Pix4Dcapture, which I’ve heard works well. 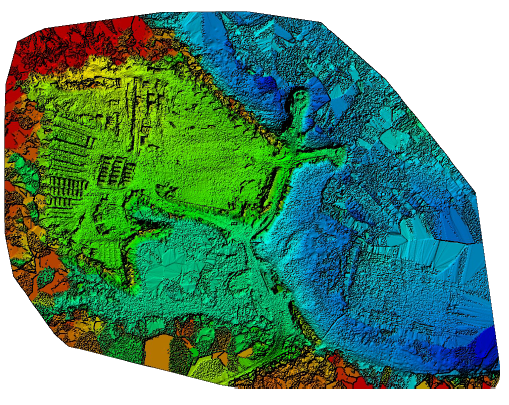 Pix4D preview of a Digital Elevation Model (DEM) produced through UAV photogrammetry methods. Drone Deploy – while I haven’t personally used much of Drone Deploy, it’s quite popular and has a large user community and good support. My main reason for not using it is that there is no terrain awareness feature, but apparently they are working on one (deal breaker for me). Subscription service that starts at USD $83/month (April 2018) for flight planning but limited processing outputs at this price. USD $250/month mimics all outputs that you would expect from Pix4D Mapper for example. WWD Processing Hub – here at Working With Drones we are launching a processing service in May of 2018, including the ability to upload any ground control points that you may have collected to include in processing. If you’ve collected data and you are not quite ready for a pricey subscription service, we can process your drone data and provide you with all the standard outputs that you clients would expect, including a finished PDF map of your study area (as an extra to the stitched final data products). Details coming soon! There are many other options out there in the market for capturing and delivering your drone data, I’ve just name a few here. For custom built drones, I’ve used Mission Planner quite a bit as well which is popular because it’s free, open source, and can help you to capture data just as easily as the other mainstream apps currently on the market. Before I stepped into the world of commercial drone work, I never used to have multiple weather apps on my phone or even weather websites bookmarked on my computer. Now, that’s an essential part of the routine when getting ready for UAV mapping. One of my go-to sites for various forecasts, including wind and precipitation is Windy. This website (also an app) allows you to get a localized forecast, especially for remote areas where searching for a major city on a mainstream weather website just doesn’t do the trick. This site has definitely saved me from wasting time, money and taking unnecessary risk when planning UAV flight days, especially operating here on the west coast of Canada. I’ve found that it’s much better to pick a favorable flight day than ending up with mediocre or broken data because of the tough conditions. Even worse, succumbing to the pressure to fly in bad conditions can lead to a crash, loss of a drone, and loss of the client! It’s much better to “live to fly another day” even if it means a slight change in the project schedule. 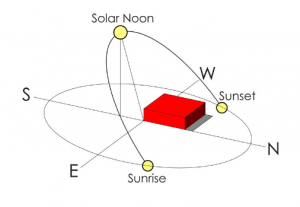 Another best practice that is worth keeping in mind is the concept of solar noon, and the sun angles throughout the day. When mapping, particularly with multispectral cameras, it’s important to fly as close to solar noon as possible to minimize shadows. Following some agricultural flights in the past, I’ve run into problems with shadows wreaking havoc on the data when I was applying different vegetation/crop indices. Instead of picking up true pixel values in those areas, they were misrepresented and I was left with a different final product than I had expected. Solar noon is the moment when the Sun crosses the local meridian and reaches its highest position in the sky (not necessarily 12:00). Picture for a minute that you are mapping a forested landscape, setting the drone to fly 120 metres AGL. There is a mountain peak right in the middle of your study area, 200 metres higher than your takeoff point and any other features in the area. First off, if you do not take that peak into account, the drone is going to end up in the side of the mountain, end of story. Okay, let’s just set our flying height to 230 metres AGL to clear that peak. Wrong! …. for a couple of reasons. First off, in Canada that would be illegal as we can’t fly higher than 120 metres above ground level. Secondly, we wouldn’t be keeping a consistent height above ground. If we have the ability to follow the terrain with our drone, we can still fly over that peak while staying legal and also keep the integrity of our data high. This goes back to the core principles of photogrammetry again, and the need to keep Ground Sample Distance (GSD) consistent when you’re mapping an area with varied topography. If you are mapping anything other than farmland (or another consistently flat site), make sure you are taking the site topography into consideration when planning your flights. One thing that I’m surprised about in 2018 is that there are still UAV flight planning applications out there that do not include “terrain awareness” features, and some of these apps come with very expensive drones. Right now, one of my favorite apps for drone mapping is Map Pilot, and one of the reasons I like it is its ability to follow the terrain in the area that you are flying. Screenshot from the terrain awareness feature of Map Pilot. During the flight mission it also shows you where your drone is in relation to the terrain profile (Image source: Maps Made Easy, 2018). One of the most common flight planning software techniques for incorporating terrain awareness is to make use of SRTM data that is used for elevation in Google Earth, for example. SRTM stands for Shuttle Radar Topography Mission, an international research effort led by NASA to obtain digital elevation models on a near-global scale. This is the dataset that is used within Map Pilot, which has a grid resolution of approximately 30 metres. Of course there is plenty of variability on the earth’s surface within that 30 metre square, but it is good enough resolution to work safely along a mountainside, especially if you are flying at a reasonable altitude and have a decent buffer between the drone and the ground surface. 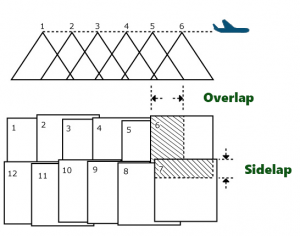 If you do not have access to a terrain awareness feature in your flight planning software, there is a workaround that you can use to help capture better data. This involves creating custom flight waypoints at varying altitudes in an attempt to mimic what a “terrain aware” flight would do. This involves checking spot elevations (in Google Earth, or in a GIS if you load a DEM for your area of interest) and then using that information in your flight planning. There is a bit more risk involved in this method, but it’s better than just setting your flight to a single altitude (enough to clear all the terrain in your area of interest) and hoping for a good result. As I’ve mentioned in other posts, capturing data can often be the easy part in the mapping workflow. Challenges often present themselves post-flight, when you are processing data that may have been collected in less-than-ideal conditions, for example. In my opinion, the experienced UAV operators set themselves apart from others in the ability to work through these challenges and avoid the need to revisit or re-fly the site, which would always be a last resort (and is often very inconvenient). One of the tricks I’ve learned along the way is that “less can be more” sometimes. For example, some photo stitching problems are a factor of too many photos, not too few as you would expect. There have been many times where I’ve removed photos from a 2nd round of processing and achieved better results than the first time around, when all were included. It’s also important to understand the accuracy of your final outputs, how well your ground control georectified the imagery, and to be fully transparent with the client with these metrics (e.g. Pix4D quality report). A processing quality report after a recent UAV mapping job. Being transparent with your clients about results is always a sound approach. Finally, always keep in mind the problem that your client is looking to solve with the data mapped by the UAV. Are you presenting it in a form that is actually useful to them, or are you just dumping the data on the client and letting them figure out the best use of it? If you’re willing to take the processed data a step further, your clients will appreciate it. This might take the form of including it in an interactive web map, within a 3D interface, or even just a detailed PDF map. Since you were on the ground when you flew the UAV, are there other observations that were made on site that can backup what the drone has captured? However you choose to approach your UAV mapping missions, take the time for quality control of your final outputs, particularly if you are providing terrain data and professional orthophotos that will be used by your clients to make important decisions moving forward. Best of luck to all the UAV mappers out there!